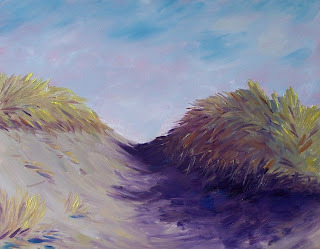 Dunes and grass on the Washington State coast. 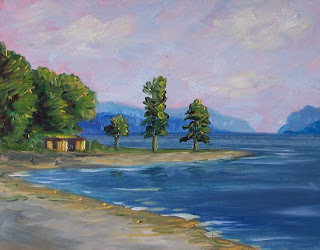 This painting is based on a photo of Potlatch State Park Beach on Hood Canal in Washington State. Hood Canal is a natural canal that is part of the Puget Sound. Grapes go fast at my house. Here's what's left of the last bunch. Practicing highlights and shadows again. 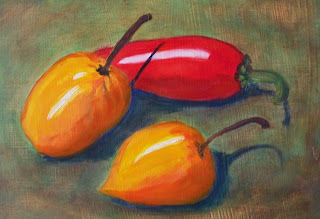 I did a couple of paintings this morning working on highlights and shadows. This is one of them. 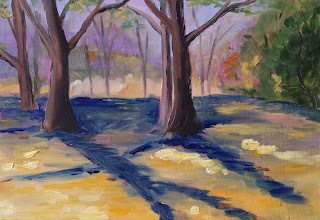 This painting is a quick one I did last fall; it makes me happy. It smiles back. It helps because I am frustrated this week with a time squeeze. Too many commitments, not enough painting time. 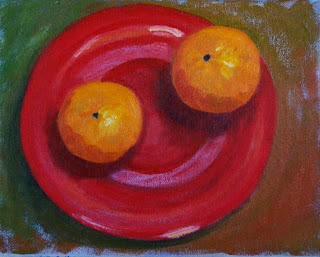 I hope this happy tangerine plate will brighten your day as it did mine. These went in the soup today. Hot. Hot. Hot. This little painting is based on a photo I took last fall. The trees and sunshine created a delightful collection of shadows on the leaf covered ground. 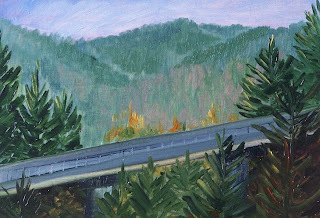 This painting represents an area near Highway 101 and Shelton in Washington State. Shelton used to call itself the Christmas tree capital of the world. Clearly many trees still grown there, but a huge decline in the logging industry has changed that little town and much of the Northwest. This train tressel in the middle of the wilderness represents the change. 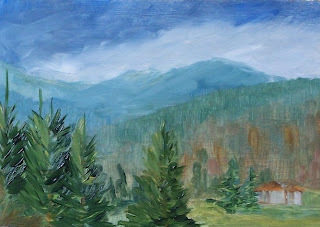 It is based on a photo I took last fall as I passed through the area. 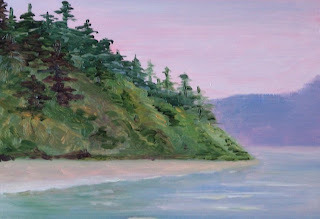 This is a view of Point Fosdick just south of Gig Harbor on the Puget Sound. 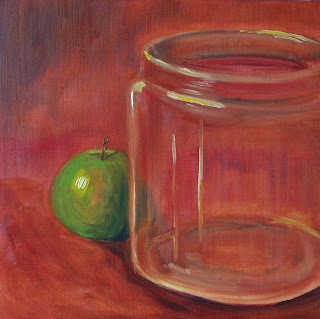 This little painting is a representation of Pt. Defiance on the Puget Sound as seen from the boathouse--a wonderful preserve of nature. 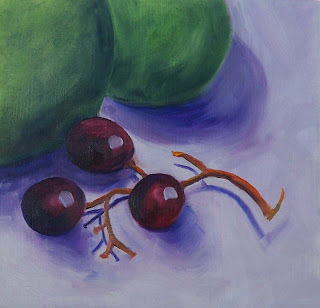 I once had an art teacher tell me that if I wanted to get better at painting the human figure I should practice by painting fruit. So here it is, my naked pear. 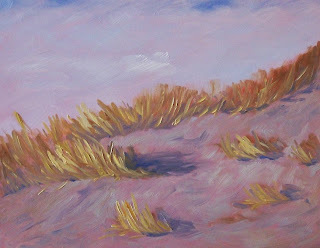 The beach grass and the sand dunes on the Pacific coast changes with the seasons and the tide. Some people say the beach is always the same, but I see it differently every time I visit. 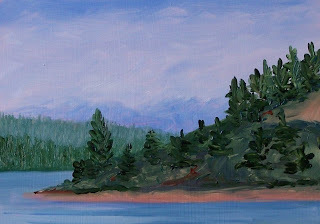 This little landscape was from a photo I took this fall near Shelton, Washington. It had been pouring rain all morning and cleared just long enough for me to get a glimpse of the rain clouds in the distance. 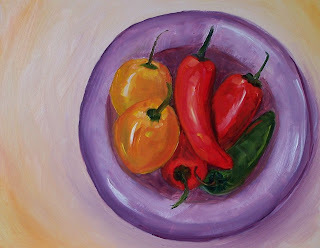 Peppers have such a wonderful array of colors and shapes. This is a collection from this morning's trip to the produce market. So fun to paint! 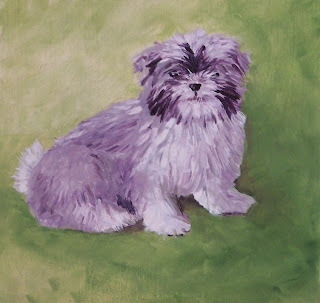 This is Chance; he is a Lhasa Apso with whom my daughter has fallen in love. She was raised without a dog in the house (my husband always said no) and now at age 24 she has fallen in love. I told my husband he could be replaced some day with just such an animal if he isn't careful. 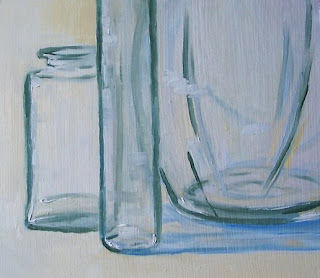 This little painting is the result of bright sunlight streaming through my studio window. 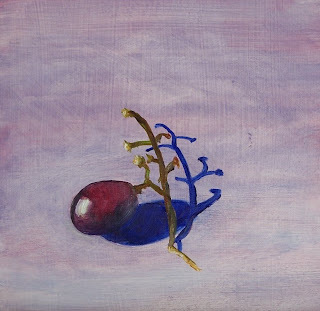 I was taken by the abstract brilliance of the shadow cast by this one little grape sprig. It is for sale at Etsy for $36.00 plus $6.50 shipping to US addresses. You can purchase it by clicking here. This apple is the result of an experiment. 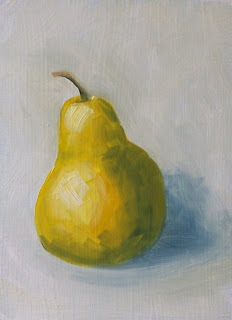 The reasoning goes that if values are correct, a painting is believable. The color is immaterial. 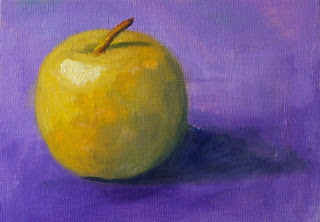 I did not have a yellow apple when I painted this. 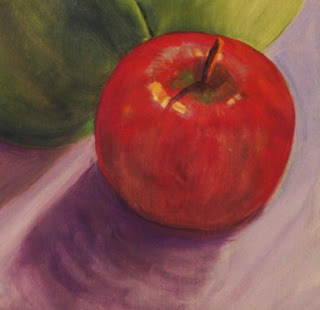 Instead, I used a green Granny Smith as my subject. 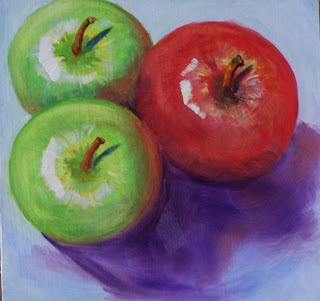 My goal was to recreate the apple using comparable values, but different colors. I think I achieved my goal. What do you think? 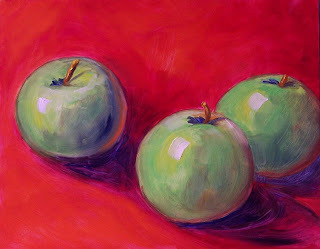 Painting these Grannie Smith apples has proven to be a wonderful way to experiment with color. My pallet consisted of alizarin crimson, cad orange, cad lemon yellow, thalo yellow green, ultramarine blue, and when I am all finished I use a little titanium white to help with the highlights. Here is more glass. I'm enjoying playing with all the qualities of light.